No, not that season--at least not yet. We're celebrating the Fall season, Autumn if you prefer, when if you live in New England as I do, the frost is on the pumpkin and the leaves turn beautiful shades of russet, scarlet, ocher, and yellow, and all the gorgeous hues in between. Here are two seasonal books for you--and a recipe, as promised, the perfect offering for a family dinner, from an old farmhouse recipe. Not originally from my family but a real farm family raising Holsteins in upstate New York. Thanks to Becky Wasserstrom for providing years of warm memories and wonderful endings to our meals. 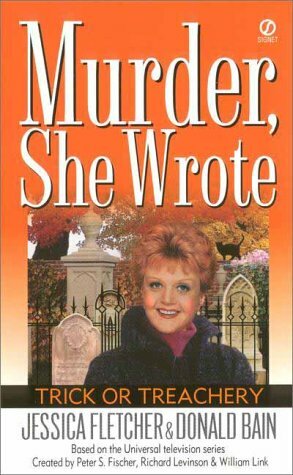 Only days away now, Halloween is the theme of Murder, She Wrote: Trick or Treachery, #14 in the series, in which is featured a historic tour of the local cemetery, home to The Legend of Cabot Cove, who makes her presence known to the fortunate--or unfortunate depending upon your point of view. Add in a real-life witch, a deadly costume party, and a mysterious stranger suspected of using the occult to bilk the naive and trusting, and I was a busy lady. 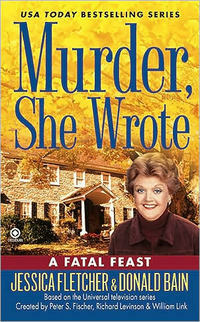 A month later, Thanksgiving is the theme in Murder, She Wrote: A Fatal Feast, #32 in the series. And guess who's coming to dinner? If you've been longing to see Scotland Yard Inspector George Sutherland again--and I was--dip into this story about when George gets to experience a real Maine Thanksgiving and finds himself investigating a mystery with his favorite lass. That would be me. Happy Halloween and Happy Thanksgiving! Combine first five ingredients. Add last four ingredients and mix until smooth. Divide into three greased and floured loaf pans (narrow ones are best). Smooth out batter. Bake at 350 For 55 to 60 minutes until a cake tester comes out clean. Cool, wrap, and store. Freezes well. Can be made as muffins or in a cake pan. Adjust timing accordingly. You can also add chocolate chips, walnuts, peanuts, or any combination of these you like. In going through our index card file of recipes, we also found Joyce Warren's Pumpkin Pie and Mrs. Bede's Brother's Sweet Potato Pie. But Becky's Pumpkin Bread trumps them all. Do you have special recipe that has been in your family for years? Becky's Pumpkin Bread sounds great! Thank you for the recipe. I was entrusted with the family recipe for Plum Pudding. It's about the right time of year to make it. Now...where did I put that recipe??? Thank you for the recipe! I love your books! And the tv series! I absolutely loved TRICK OR TREACHERY and FATAL FEAST. I am currently reading THE GHOST AND MRS FLETCHER, and so far so good. Keep the great stories coming. The pumpkin bread sounds yummie. Nothing pumpkin-y, but my granny's ginger cookies are the best! The books look great! My mom makes the best buns!